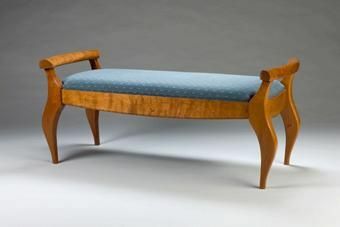 The bench is constructed from solid Cherry lumber and has an upholsterd seat. The slip seat is muslin covered then upholstered in the fabric to suit the customers decor. This make changing the top very easy and economicle if it becomes damaged or you just want a different look. This particular bench is sold but can be reproduced for you in a tmely manner. I can als custom design a bench to suit your personal needs. Dimensions: Dimensions are 50" wide by 20" deep 18" to the seat height and 22" to the hand rails.